New Year, New You! Kick-start your 2015 fitness goals the Divi way! Vacation time certainly has its benefits – new adventures, exciting experiences and an opportunity to unwind are always on the list of top reasons to plan your next getaway. But sometimes, it can be hard to keep up with your wellness goals while you’re away from home. Vacation time is typically focused more on rest and relaxation than health and fitness, but that doesn’t mean you can’t stay active in fun and creative ways during your trip. The islands that are home to our Divi Resorts offer a lot to explore, so plan to spend some time sightseeing on foot during your trip. Many of our resorts offer guided group walks of the beaches and nature trails, and there are also plenty of walkable areas around town. There is so much to see and experience on each island, so pack your walking shoes and get ready to discover new places! A fun way to get active on your Caribbean vacation is to take advantage of the islands’ most popular amenity – the ocean that is just steps away from our resorts! Our Divi Resorts destinations offer a variety of ocean activities, from snorkeling, to paddle boarding, to jet skiing. Several of our resorts offer water sports centers so that you can easily rent your equipment and head out to the ocean, and our resorts on Bonaire and St. Croix also offer PADI 5-Star Dive centers for exciting scuba adventures. There is never a shortage of activities available at Divi Resorts, and many of the daily activities are focused around fitness. From Caribbean dance classes to water aerobics, there are always plenty of ways to keep moving. 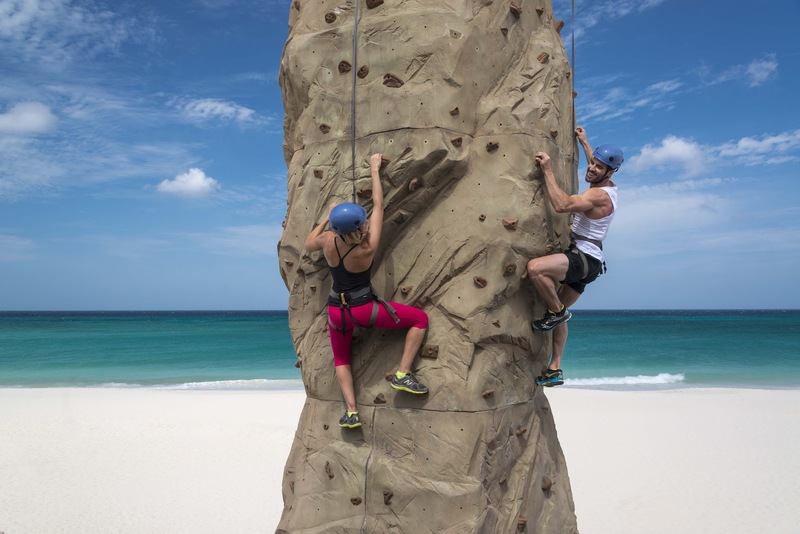 You can also get adventurous with your fitness routine, trying out something new like the rock climbing wall on Aruba or a guided trail hike on Barbados. It’s easy to keep up with your health and wellness goals when you find ways to make fitness fun! A great way to bring more fun to your daily physical activity is to invite friends or family to participate with you, and at Divi Resorts, there are a ton of games to get everyone moving. Challenge someone to a game of tennis, volleyball, golf, bocce ball or horseshoe; you’ll be so entertained, you may forget that you’re getting a workout. Just because you’re on vacation doesn’t mean you have to give up on your goal to eat better. Dining at Divi Resorts’ restaurants is a delicious way to keep up with healthy eating habits while you’re on your trip! Our chefs have introduced healthy versions of old favorites, like Spinach and Artichoke Dip made with Greek yogurt, so that you can satisfy your appetite without over-indulging on calories. The restaurants are also offering new farm-to-table and dock-to-dish specialties, deliciously flavorful salads and nutritious side options to complement your healthy meal. Keeping up with your New Year’s resolution for improved health and wellness can be easy and fun when you vacation at Divi Resorts! Watch what you eat & stay active! What are your best tips for staying fit while on vacation? Let us know by leaving us a comment!